Pivot Tables reorganize and summarize selected columns and rows of data in order to obtain a desired report. For more information, see Viewing Data in a Pivot Table. The Pivot Tool contains a list of columns available in the active report and Group By, Across, and Measure sort fields. Drag the columns into the desired sort field. Run the active report, click the arrow in any column heading, and select Pivot Tool. Left-click and drag the columns into the Group By, Across, and Measure sort fields. A column must be included for the Group By and Measure sort fields (Measures typically define how much or how many). The Across sort field is optional. 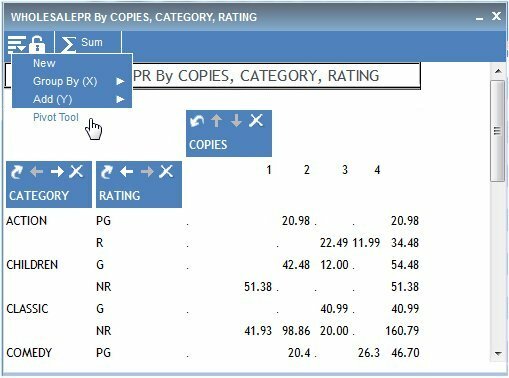 In the example below, CATEGORY and RATING are the Group By sort field, COPIES is the Across sort field, and WHOLESALEPR is the Measure field. Click OK to close the Pivot Tool. The Pivot Table is generated based on the sort fields selected. You can click the New icon from the Pivot Table and select Pivot Tool to open the Pivot Tool again. The same column cannot appear in both the Group By and Across sort field. Columns can be dragged between the Group By, Across, and Measure sections but they cannot be dragged back to the Columns section. If a column already exists in the Measure sort field, an additional column that is dropped into Measures section replaces the existing column.